[SatNews] Quickplay has rolled out a number of significant enhancements to the firm's managed video platform service, designed to address major friction points that can inhibit the growth and profitability of multi-screen, next generation pay-TV and OTT premium video services. Consumers now expect personalized discovery across video sources, a large on-demand catalog, first run original programming, and the hottest live content delivered with the highest quality to any device and over any network. Meeting these expectations is complicated by the ever changing, highly fragmented and non-standardized device, DRM, and player ecosystems and the inherent variability of unmanaged IP networks. Leading Service Delivery Model - significant investments in IT infrastructure, network, and expertise to enhance the efficiency, operations and delivery of Next Generation premium video experiences. With the renewed operating model, service providers and content programmers benefit from a portfolio of over 220 leading service functions, 200 video engineers and media specialists, and a growing set of delivery centers across North America, Asia and Europe to facilitate 24/7 support, globally. 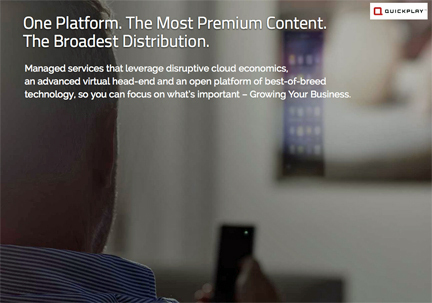 The model manages all platforms and the end to end delivery of multiscreen, next generation Pay TV and OTT premium video services, further augmented by best practices, advanced performance metrics, and streamlined procedures. Service providers and content programmers reduce capital expenditures and risk while increasing customer responsiveness, time to market, and carrier grade scale and quality of service. Content Merchandising Service – next generation content management and merchandising tools and service capabilities that replace or augment a traditional Content Management System (CMS) by offering complete flexibility, extensibility, and control for providers to rapidly and cost effectively build and adapt Next Generation TV (NGTV) offerings with access to a suite of metadata and video content lifecycle capabilities. Operators and content programmers can monitor the status of content assets in the virtual head end, dynamically enable new commercial models by adding content and metadata, configure store front merchandising, create new pricing, product packages and promotions, and generate reporting and analytics to measure and drive service adoption, usage, and profitability. Next Generation UX/UI Design Pack – a next generation video hub experience that adapts to all screens and resolutions, accelerating the unified, next generation discovery and viewing experience across video services and sources, including Live and VOD pay-TV services, OTT services, and Web content. The full-featured design pack provides a conceptual layout with visual hierarchies that enable intuitive navigation, search, main screen and second screen integration, recommendations, support for cloud DVR and playback, user personalization and social integration for both Live and VOD content. The Design Pack serves as an accelerator for providers looking to launch OTT and NGTV services quickly and efficiently. Quickplay is exhibiting the enhancements to its Next Generation Video Platform Service at IBC 2015 on stand: 14.D27; additional capabilities to the platform are earmarked for roll-out over 1H 2016.